The location and real name of St. Agnes Hospital were closely guarded secrets to keep away curiosity seekers. Once the show aired though, word quickly got out. The fate of the real "St. Agnes" is being decided. Will it be a golf course? An amusement park? An office complex? Time will tell. One thing's for sure -- the second episode of "Fear" was a staggering disappointment for those interested in real paranormal research. The props that MTV laid about were entirely unnecessary and disrespectful - both to the memory of the individuals who suffered inside those walls, and the participants of "Fear" who set aside their fears to complete the dares. The fake blood, the phony spiderwebs, the dummy in the attic - these items gave Fear the appearance of a Jaycees Halloween Haunted House. For those who were let down, you can visit the empathetic folks at Western Connecticut Paranormal Research for a fascinating and real paranormal investigation of "St. Agnes". People have very strong feelings when it comes to Ouija Boards. Some feel that they are nothing but toys. Others think they are effective and safe tools for use in channeling spirits. And still others believe that they are extremely dangerous. Read other's viewpoints at Epinions, or write your own opinion. Visit Taramisu's Custom Channeling Boards & Ouija Information, the company that made the board for "Fear". You can read the creator's viewpoints here. Delware Valley Demonology Resarch has very strong feelings on Ouija boards. You can read them, and see their collection of antique boards here. One board - two very different viewpoints. What's yours? Andelberry Estate: Want to tour a real haunted hospital? Ghosts of the Asylum: Another scary haunted hospital tour. Hospital Doors: A group of Boy Scouts on a dare get terrified in a haunted hospital. Haunted Hospital: What if you found out your apartment had once been a hospital morgue? Starling Loving Hall was investigated 10/13/00 by the Columbus Paranormal Investigators team. Vancouver Barracks Hospital was investigated by Jeff Davis. You can hear a creepy recording of his experience here. Weird Nursing Tales: Just as the title says, some very creepy stories here! Any one of these could be the site for Episode 2. All have fascinating histories, and all hold within their walls the echos of pain and suffering. St. Agnes Hospital - No, not the St. Agnes, but another fascinating and important endangered historic site. Bartonville State Hospital - An entry from Prarie Ghosts. You can see pictures of Bartonville here. Byberry Mental Hospital - I grew up near this incredibly freaky site, and there are urban legends galore surrounding it. Just about every spooky tale I heard as a kid is posted here. Byberry deserves it's own page because of the number of web sites about it. View historic photos of the horrifying conditions that over 6500 inmates had to suffer in a building designed for about 3000. One Byberry page with some photos can be found here, and there is another at this site. Cane Hill and Netherne - Two abandoned asylums in the UK. Extremely extensive explorations, notes and pictures. Fairfield State Hospital - Have you washed your hands? Fort McDowall has a 360 IPIX you can tour. What is at the end of that hallway??? Hudson River State Hospital - Why are all the "Caution" signs upside down? Indiana Central Hospital for the Insane - Extensive historic information. Northampton State Hospital - Sad... so sad. Utopian dreams of humane treatment were at the heart of this hospital. What the patients endured is another story enirely. Other Northampton pictures can be seen at Noho's Abandoned Asylum, The Asylum, The Ruins Project, and plans for the future at Northampton State Hospital: In Memoriam. Of course, the finest in de-classified pictures were taken by IRONFIST's intelligence gathering agents! Northern Michigan Asylum - Photos from Angels in the Architecture exhibit. Overbrook - Ugh! Just what did WeirdTravels find in that bed??? Pontiac State Hospital - View the last days of this amazing structure. St. John's Hospital: Creepy pictures of an abandoned hospital. 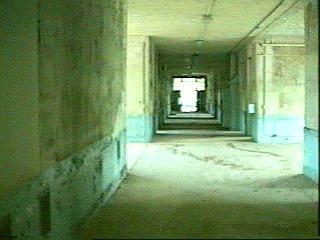 Waverly Hills TB Hospital - UGH! What a horrible place!! Thanks to Ron for giving us such a disturbing tour. The votes are in! See the results of "Where is St. Agnes?" Rabies and animal bites - abandoned buildings are now the homes of rats, mice, stray dogs and cats, not to mention the various racoon, fox and other wildlife. Exploring places you at high risk of disturbing these animals and getting bit. Transient, and possibly disturbed, individuals - abandoned sites are often the place for drug users and other disturbed individuals. While the humanitarian in us does not want to think ill of homeless individuals, the fact remains that many are extremely emotionally ill and quite dangerous. Injury - These buildings are condemned and abandoned for a reason. Floors, ceilings and walls are decaying and damaged, and you run the risk of a several story fall to a broken bone. Arrest - These sites are all on private or government owned property. There are strong fines and punishments for trespassing. Ask these dumb guys! Still want to visit?? Yes, I know you do. I do too. Do yourself a favor, contact a local paranormal research group, or visit Historic Asylums of America for an extensive list of sites you can officially visit and tour. This website copyright 2001 FearOnMTV. Plagiarizers will be beaten severely about the face and neck. Void where prohibited. Some assembly required. List each check separately by bank number. Batteries not included. Contents may settle during shipment. Use only as directed. No other warranty expressed or implied. Do not use while operating a motor vehicle or heavy equipment. Postage will be paid by addressee. Subject to approval. This is not an offer to sell securities. Apply only to affected area. May be too intense for some viewers. Do not stamp. Use other side for additional listings. For recreational use only. Do not disturb. All models over 18 years of age. If condition persists, consult your physician. No user-serviceable parts inside. Freshest if eaten before date on carton. Subject to change without notice. Times approximate. Simulated picture. No postage necessary if mailed in the United States. Breaking seal constitutes acceptance of agreement. For off-road use only. As seen on TV. One size fits most. Many suitcases look alike. Contains a substantial amount of non-tobacco ingredients. Colors may, in time, fade. We have sent the forms which seem to be right for you. Slippery when wet. For office use only. Drop in any mailbox. Edited for television. Keep cool; process promptly. Post office will not deliver without postage. List was current at time of printing. Return to sender, no forwarding order on file, unable to forward. Not responsible for direct, indirect, incidental or consequential damages resulting from any defect, error or failure to perform. At participating locations only. Not the Beatles. Penalty for private use. See label for sequence. Substantial penalty for early withdrawal. Do not write below this line. Lost ticket pays maximum rate. Your cancelled check is your receipt. Add toner. Place stamp here. Avoid contact with skin. Sanitized for your protection. Be sure each item is properly endorsed. Sign here without admitting guilt. Slightly higher west of the Mississippi. Employees and their families are not eligible. Beware of dog. Contestants have been briefed on some questions before the show. Limited time offer, call now to insure prompt delivery. You must be present to win. No passes accepted for this engagement. No purchase necessary. Processed at location stamped in code at top of carton. Shading within a garment may occur. Use only in well-ventilated area. Keep away from fire or flame. Replace with same type. Approved for veterans. Booths for two or more. Check here if tax deductible. Some equipment shown is optional. Price does not include taxes. No Canadian coins. Not recommended for children. Prerecorded for this time zone. Reproduction strictly prohibited. No solicitors. No alcohol, dogs, or horses. No anchovies unless otherwise specified. Restaurant package, not for resale. List at least two alternate dates. First pull up, then pull down. Call toll free before digging..